It seemed natural to introduce Sol to yoga early on in his life, since it was something I did with him while I was pregnant. I've gone through phases of absolutely loving yoga and meditation classes, but when I'm not doing it regularly, I need a little coercion. My girlfriend and running partner, Leah, was persistent in asking us to join her and her daughter, Julia. My first thanks is to Leah! We are so glad we attended and look forward to doing it again. We attended the class right around the time that Sol started feeling confident sitting up. I was so impressed I was able to leave him on the mat while I prepared for the class. We decided to come very last minute. Not only was he due for a feeding, but he also needed a diaper changing. 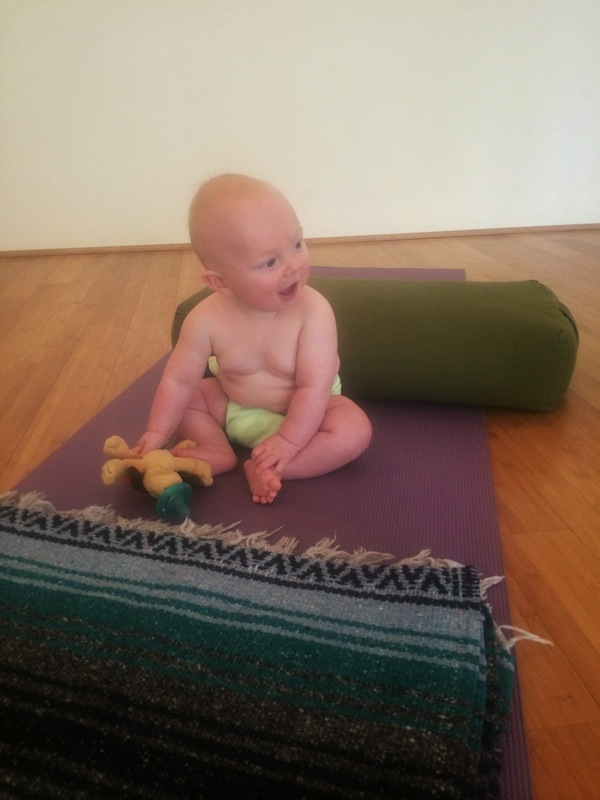 Hence why he is only in a diaper--I didn't want to waste anymore precious yoga time! It was bad enough we had to feed 15 minutes into it. How cute is this?? Julia and Sol have known each other longer than they can comprehend! We had a few playdates when they were both newborns, but we're behind on visiting. I hope that when the time is right, Leah and I will be able to get back to running together regularly AND bring the little ones along with us! They should be used to sleeping through us chatting, so if they know what's good for them--they'll keep that up when we pull out the strollers and our running shoes! I wish I had taken a picture with Katherine Kimerling Bromberg, our yoga guru for the day. Katherine and I grew up together. She is a youngin compared to 31 year old me, but we have a great connection--and I love when I get the chance to be with her. My second thanks goes to Katherine!! She has always had a way with kids. It really shined through her warm welcoming, patience, and fun curriculum. 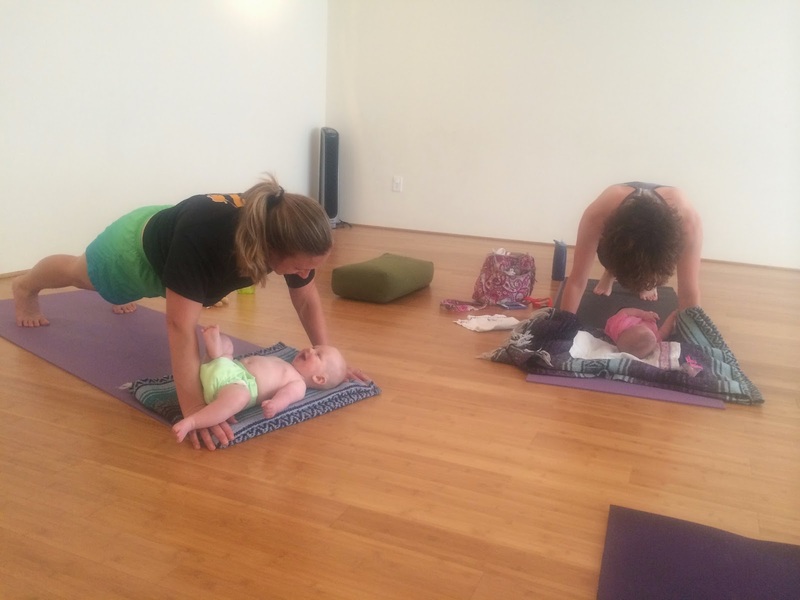 I highly recommend the Parent Baby yoga class. It was a wonderful way for Sol and I to spend time interacting with each other. At home, we interact with toys and reading; but only for so long. After 15 or 20 minutes, the dishes or my schoolwork start calling my name. Sol either plays on his own OR cries for me to come back to playing with him. I loved bonding with him while stretching, cuddling and hugging, and singing/playing. Villager Yoga is one of many gems in my neighborhood, Cahaba Heights. I love that it offers a beautiful, relaxing space with wonderful classes and even more beautiful and wonderful teachers. 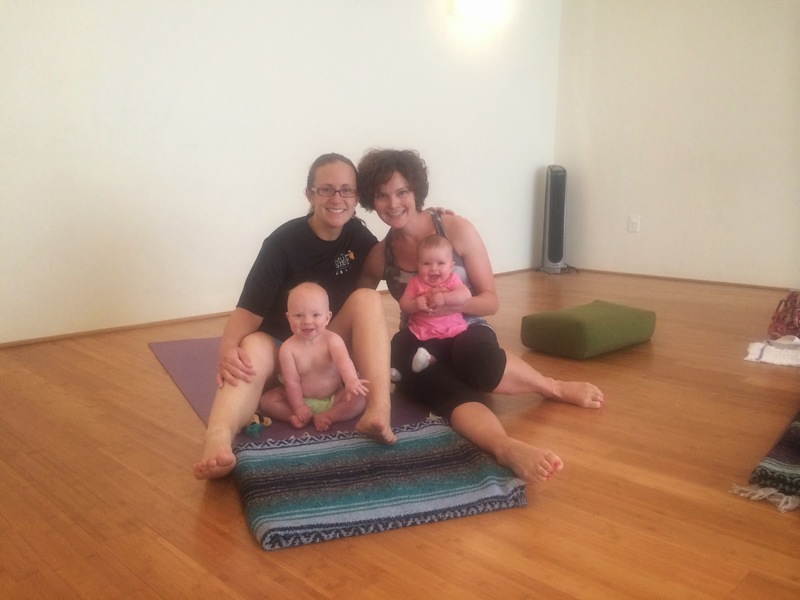 My third and last thanks is to Annie, who owns, runs, and lives Villager Yoga. I miss seeing you and hope it's not too long before we can come back!! You and Me at the J! !